Yesterday I talked about Robinhood Gold, and I have no updates as of today. If I keep adding money to my account at a steady pace, I may be able to try Robinhood Gold out in November. I bought a new stock this past week! I bought a share of First Energy, stock ticker FE, for $33.07. If you want to learn more about it, here is the link to their website - https://www.firstenergycorp.com/about.html. The reason I bought this stock was to add more weight to my utility stocks. It's also an electricity provider, which I'm trying to stay away direct coal/gas energy companies. I don't think they have a stable long-term future. Since February of 2014, FE has paid out a quarterly dividend of $0.36. I realize they haven't raised their dividend, which would be a requirement for other dividend bloggers. As for me, I'm trying to research and learn about companies I like. They haven't raised their dividend, but they haven't reduced it either, so that's good. A $0.36 dividend times 4 = $1.44. $1.44 of dividends divided by the purchase price of $33.07 = 4.35%. This is above 4%, nice! PEG ($0.41 x 4 payments/year) / $45.90 purchase price = 3.57% yield - good! If you use the Robinhood App for trading stocks, you might have received a notification about Robinhood Gold. You can read more about it here - http://blog.robinhood.com/news/2016/9/28/robinhood-gold. Robinhood is and has been an amazing app. When I tried reading through about Robinhood Gold, not everything was clear, which was a little troubling. Robinhood Gold lets the users do 2 new things and 1 "new" thing. You'll see why I put "new" in quotes in a bit. Robinhood Gold Feature #1 - Trade 30 minutes before the stock market usually opens, and trade for 2 hours after the markets close. Robinhood Gold Feature #2 - Margin. The Robinhood site says the users can receive a credit of an amount that is twice of the buying power. What is my buying power right now? Under $3. So if I deposit ~$97, I'll have $100 in buying power. With Robinhood Gold, this would be like have $200 to spend on stocks. Traditional brokerages charge interest on this credited money. Robinhood is implementing a subscription system of a flat rate per month. (I'm not sure how this will work if users are losing money, but I have no doubt you'll have to pay back money that you lose). I'm going to look more into this, or I might even try it. Robinhood Gold Feature #3 - Using money right away from your bank to buy stocks, and using money right away to buy more stocks after you sell stocks. I feel like I could already do this with Robinhood Instant. I don't think this is a "new" feature. There is a cost to using Robinhood Gold, which is great. Why is it great? Buying and selling stocks will still be commission free, but Robinhood will also make money with Robinhood Gold. If we want Robinhood to keep growing, it needs to make money. Robinhood is a business. I believe it will someday overtake ETrade and TDAmeritrade, and this is one way that they will do it. 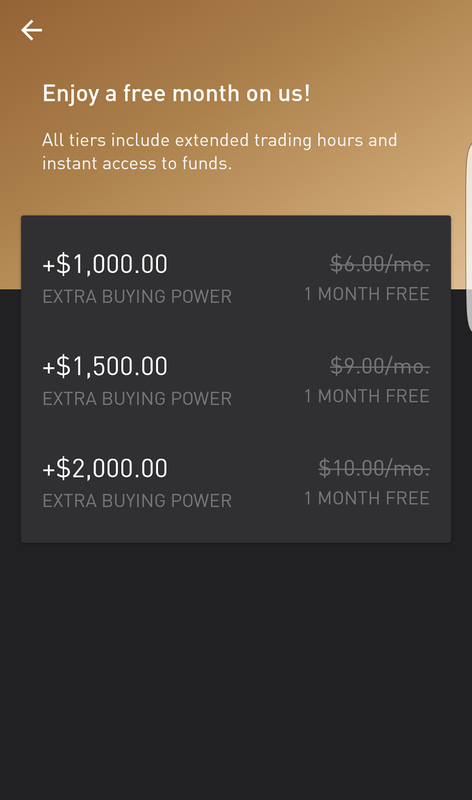 Below is a screenshot of the costs (at least at my $ amount invested) to use Robinhood Gold. I'll keep digging into this and try and learn more. Another year goes by, and I'm still not under 200 pounds :( My new Mission is to be under 250 pounds by the end of the year. Run a half marathon. Originally I had a full marathon listed, but I need to be realistic. My new Mission is to be able to run a 5k in under 30 minutes. Plan out meals on a weekly basis/make meals on Sundays. I believe this is still obtainable and a good Mission. Sleep on a regular schedule, even on weekends. I'm getting closer to this, and I think a lot of it is overcoming a mental barrier. This is still a good Mission. I'm going to bring this down to 20 push ups in a row. Ok, so over the course of a year, these would have been "easy" Missions. The past nine months are pretty much gone, so I just need to focus on the next three months and make them count. This will be a Mission that I will keep working on. I'm actually kind of annoyed and mad at how much sodium is in food. Just going through today, and looking at food labels, there is a high amount of sodium in a lot of foods. I encourage you to look closely at food labels and see how much sodium you're consuming. It looks like I'll be adding a lot more fruits and vegetables to my meals, which I should have been doing anyways. It's almost October, so I believe it's time to review where I'm at for my Missions. I'm also at the point where I might change/adjust my missions to still I'm going to start with my Technology Missions. Get a new phone. - This happened around June of this year. The context for this Mission was that up until this summer I was using a Samsung Galaxy S4, and the phone was becoming slow and the battery wasn't lasting too long. Help someone who isn't technologically savvy with computer/phone issues. - Accomplished Thursday, September 22nd. I was able to help someone with Microsoft Excel. Considering I used to spend 3+ hours/day on Excel, I'm glad I could put some of those skills to work. Regularly have 0 emails in my inbox. - Not happening, but I'm still going to keep this as a Mission. Check my phone 50 or fewer times throughout the day. - I'm going to change this. For the rest of the year, I'm going to go 1 hour a day without looking at my phone. I think detaching from my phone for a solid hour will be good and have the same benefits as the original Mission. Install/use/review a home automation or "Internet of Things" device. - I'm going to keep this Mission. This will probably happen around the holidays. 1 changed, and going to happen. I did not buy any stocks this past week. I really didn't even follow the market too closely this past week, so not too many updates from last week. So my yield is currently over 4%, nice! What if we just slept? What if we went to sleep at a consistent time every night? What if we put our phones down while laying in bed, instead of scrolling through our feeds? What if we interrupted our friends while they were talking, and said "Hey, I gotta go." ? What if we paused our YouTube videos and Netflix shows, and waited to finish them until the next day? What if we hung out with our friends earlier on the weekends and still went to sleep at a decent time? I know the statistics on how much sleep we need. I know I should be going to sleep earlier. But I don't actually do these things. Would the benefits of sleep outweigh the tasks/little things I didn't finish at night? Am I actually productive at night? I don't know, probably not. I guess I'm just thinking about if we just went to sleep at a decent time. I'm thinking about if we had the mental determination and mental motivation to stay consistent? I didn't eat that great of a lunch today (calorie-wise) and I had a large afternoon snack. I was feeling full, heavy, bloated, etc. At the point, I almost considered having a large dinner because I deemed the day as "ruined" calorie-wise. I decided against having the large dinner, and I feel good about that decision. I got to my 10,000 steps today, which is good because I struggled with that last week. I can't really change what the scale will result in tomorrow, but if I keep eating good and walking 10,000 steps a day, I should make progress. I may post some sort of update tomorrow, and hopefully it's a way to keep me accountable! It also be important to establish, or reestablish good eating and exercise before winter hits. Working out in the winter is tough! I bought two shares of a new stock this week: DDR Corp. (DDR). I bought these on different days, and the average cost was $18.04/share. DDR falls under the category of a REIT (Real Estate Investment Trust). This yield is above 3%, so I am happy with that. I received 3 dividend payments this week. The Target dividend was scheduled on Saturday, which was a little confusing since dividends usually aren't paid on weekends. Minimalism - Slowly but surely. Decluttering. Apartment should be "Friend Ready" in about 2 weeks. Investing - Stocks went up today after dropping a lot on Friday. I didn't read any news about the market, just looked at my portfolio. Technology - Reminder that you can use the site https://haveibeenpwned.com/ to check if your account information has been leaked online from data breaches. Health - I haven't drank any pop since last Monday. I've been tracking my calories every day. I've been staying within my calorie budget aside from this past Friday night. I was starving and went over my calorie budget. I'm going to dedicate Tuesdays to weigh-in days. I hope tomorrow's number is good! I reset my entire phone last week! I was looking at some tweets and clicked on a link that took me to a sketchy site and it started downloading something automatically. I'm normally pretty safe on my phone, so this doesn't happen very often. I decided to do a complete factory reset on my phone. It was kind of nice resetting my phone. I've noticed that the battery life has improved, probably since I don't have as many apps installed. I've also been "choosey" about which apps I reinstall on my phone, I opted not to reinstall all of them at once. I also have a ton more space on my phone. Again, this is a result from fewer apps and essentially 0 pictures or videos on my phone (I made sure everything was backed up on Google Photos before the factory reset). There were only two downsides to the factory reset. I lost contact information for a person who I had saved to the phone and not Google contacts. I lost notes that I'd saved to the phone and not on Google Keep. I'm not heartbroken about it. I already got the contact back in my phone, and saved on Google contacts this time. I'm going to try and be mindful about which apps I choose to reinstall, and only install ones that I will actually use. Having fewer apps help with my overall Missions towards minimalism and technology. Aside from Google, Samsung, and Verizon default apps (I even turned off all the stupid Samsung and Verizon apps I could), I have 21 additional apps installed on my phone. Just yesterday alone, my stocks in Robinhood dropped 2.73%. I don't actually lose money until I sell the stocks, but it does raise concern why stocks dropped so much in one day. I did a quick Google search of "Why were stocks down today" and I found out it had to do with the fed and interest rates. This doesn't really concern me for a couple of reasons. The first reason is that I don't understand the whole interest rate thing very well. The second is that I'm disillusioned with letting that drama affect me and my investing. Maybe I should be more concerned with it, but I don't feel the need to get worked up about it. I bought another share of Whole Foods this week to average down the average cost of this stock. I bought another share for $29.00. The next dividend payment should be $0.135. This number times 4 payments a year = $0.54. This yield is on the lower end, but Whole Foods payout ratio is low too. If I hold long term, and Whole Foods raises their dividend, I'll reach a 3%+ yield. I received $3.49 in dividends just this week! This will probably be the biggest week for the rest of September, and the biggest week until December! It's dark out now by 8 P.M. Some trees are starting to turn orange and red. It's a little bit cooler at night now. Fall is coming, and plenty of people are thrilled by this. I am not one of those people. I can't help but think about how fall leads into winter, and winter is usually pretty miserable. I will say that I had a great fall last year, so many my opinion will slowly change. The past few weeks have been flying by and it seems the first week of September always goes super fast. I guess I'm just reflecting on how fast time is moving. Enjoy the time that you have! This week I'm working on throwing stuff out. Even stuff that I have sentimental attachments to. I just want to be rid of the clutter. It really is time to get rid of it. What's the difference this time? It's that I've lived in my apartment for over a year now. Stuff that I haven't used, I clearly don't need. I'm also eating clean now. No pop, so super sweets, no eating way over my calorie limit for the day. I always thought by now I'd be in good shape. At this rate, I'm never going to be. I hit a number on the scale today I'm not happy about and I need to quit pushing off getting my life together. What's the sustainable part about this change? The fact that I know better. Mind over matter. Pop is good and I drink it when I'm stressed, but I'll just need to drink water. What's sustainable about my decluttering? The fact that I want people to come over and hang out at my place. In the middle of typing this I've been getting up and throwing stuff away. This change will last. I just need to tell myself that and it'll happen. I was very dumb and had not changed my Dropbox password for a long time. My account was one of the 68 million that was exposed due to Dropbox being hacked. The ONE smart thing I did was put 2-step verification on my Dropbox account. I can't tell if my Dropbox account had actually been logged in by someone else. I'm hoping that the 2-step verification was strong enough to keep someone out. I'll need to go through my Dropbox and look things over, along with removing anything that is too confidential. I'm trying not to overreact and take my information off the cloud. I'm going to dig into this problem a bit more and figure out more ways to be safe. I bought another share of Verizon (VZ) this week! I bought my 2nd share of Verizon for $52.70. According to my Robinhood app dividend history, Verizon has paid its last 4 dividends on Nov 2, Feb 1, May 2, and Aug 1. I assume the next dividend payment will be around November 1st or 2nd of this year. Little by little I will keeping building up my portfolio. I'm feeling confident I've started a trend of moving my portfolio upward that I can sustain. I received 3 dividend payments this week. Last night I went over to a friend's place for chili. Why is this important? BECAUSE CHILI IS DELICIOUS! For real though, it's because I was able to walk in, serve myself, take an amount I was hungry for, and sit down on the couch next to my friend. It's been a while since I've had a friend where I felt comfortable "making myself at home" at their place. This was the same friend that I picked up some heavy whipping cream for the other night when I was at the grocery store (They cook a lot). Did I ask for money from this friend? No. I will do things for them, and they'll do things for me. I think it's important to find friends like this because it reminds me of family. If you're living far away from family it's important to have a good support system. My first job out of college, it took me a long time to find friends. Depending on the friends, it can take a while to feel comfortable around them. I'm very grateful I'm developing good friendships here. I should probably let this friend know how much I appreciate them!